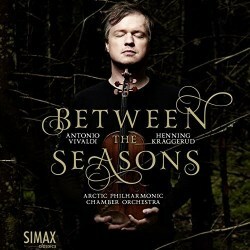 “Between the Seasons” implies that Henning Kraggerud, who is a prolific composer besides being one of the world’s foremost violinists, has inserted compositions of his own between the four Vivaldi concertos. And this has not been done at random. Leonid Desyatnikov arranged Astor Piazzolla’s The Four Seasons of Buenos Aires for violin and string orchestra and inserted them between the concertos of Vivaldi’s quadrology and created a unit, but inverted, since summer in the southern hemisphere is winter in the northern one. Kraggerud’s method is different. His insert pieces are chosen to created bridges between the Vivaldi concertos with key-related music. In other words: if you listen to the whole disc from beginning to end you get a feeling of continuity, even so far that the last bridge, Victimae Paschali, connects the Winter concerto with the Spring concerto and thus creates a kind of perpetual cycle, just as the “real” seasons imperceptibly follow each other year after year. The idea is brilliant and the concept works. Another interesting feature is that the climate in Italy around 1725 – when Vivaldi composed his cycle – was uncommonly severe and had great similarities with the climate in present-day Norway. This can also be traced in Kraggerud’s interpretation of the cycle. I’ll point to a few things that I have perceived. Kraggerud, who has been playing the Vivaldi concertos from time to time during half his life, opts for a rather speedy and dramatic traversal of the cycle. The Spring opens lively and rhythmically alert and the storm is uncommonly threatening. The birds are chirping more eagerly than ever. The largo is magical and reminds a Northerner that never is the sunshine more welcome and soothing than in Spring. The goatherd falls asleep but his dog barks drowsily until he also takes a nap. The dancing in the allegro is truly rustic. The Preghiera by Kraggerud that follows is not just a bridge from Spring to Summer but a self-contained and deeply felt prayer of mercy, achingly beautiful. The staging of Summer is likewise graphical with a highly dramatic thunderstorm in the presto movement. The Postludium, from Equinox, issued just a couple of years ago (review) is wonderfully hushed. In Autumn “The cup of Bacchus flows” when the harvest is safely gathered in and we hear very clearly how the peasants reel before they fall asleep. The hunt in the third movement is certainly more violent than ever, and when the prey finally is shot and dies, so does the Autumn. Kraggerud’s the last leaf is a dirge, not only over prey and Autumn, but also on a more personal level over a young cousin of Kraggerud’s. This is an example, as good as any, that it is possible to write contemporary music in a tonal idiom that doesn’t sound like a pasticcio. A wonderful piece! If the Winter 1725 was as severe in Venice (or Mantua) as it usually is today in Scandinavia, I fully understand that the people don’t just shiver in the first movement but shake violently from the cold. And they do enjoy the warmth before the fireplace in the largo movement, whereupon they in the finale try to walk on ice – unsuccessfully. After that they do long for Spring and Victimae Paschali help them to endure. I suppose that most readers are well supplied with recordings of Le quattro stagioni and feel unwilling to invest in another. There are two arguments against that. Firstly, the four compositions by Henning Kraggerud are truly great music, accessible and beautiful, and should be heard by every music lover. I played the whole disc to a group of average music lovers, none of them particularly interested in contemporary music, and everyone loved it. Several of them wanted to know where they could get hold of a copy. Secondly, in the bargain you also get one of the best recordings – maybe the best – of the Vivaldi cycle. Maybe you can scrap the ones you already have! The solo playing is stunning, the orchestra, the world’s youngest and northernmost, is fantastic and the recording is superb in every respect. Besides that there is a very personal essay on Vivaldi and his four seasons by Erik Fosnes Hansen. Things couldn’t be better!